WE know eggs make a healthy, affordable and tasty meal - but now research has revealed just how many it is safe to eat in a week. And in good news for lovers of a frittata or scramble, the American Journal of Clinical Nutrition found there were no adverse effects from having as many as 12 over seven days. The researchers found that weight loss was similar over a year for people on a low-egg (two a week) and a high-egg (12 a week) diet. They discovered that even participants with type-2 diabetes did not suffer adverse effects from eating a diet high in eggs such as inflammation, cardiometabolic risk levels or raised glucose levels. Eggs are filled with vitamins, minerals, protein and healthy omega-3 fats. 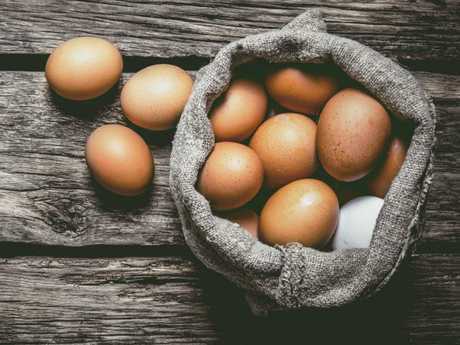 "A healthy diet based on population guidelines and including more eggs than currently recommended by some countries may be safely consumed," concluded the researchers. It has prompted a call for a review of the National Heart Foundation guidelines, which recommend just six eggs a week. While eggs - particularly the yolk - are high in fat, they are full of vitamins, minerals, protein and healthy omega-3 fats. The yolk is packed with nutrients, so there's no need to opt for egg-whites only. Eggs are filling and do not raise cholesterol in the blood. People who replace a grain-based breakfast with eggs have been found to eat fewer calories over the day. Just don't store them in your fridge door. How much bread can you get away with eating each day?